Emergency aid to the People of Myanmar. What is next step of the JVP? Police spokesman SSP Ranjith Gunasekara says 9 persons have been killed in the blast that occurred on a train travelling from Fort to Panadura yesterday evening. Acting director of the Colombo South General Hospital Dr. Wilfred Kumarasiri said 73 injured persons have been admitted to the hospital. He said six bodies also lie at the hospital.The blast occurred at around 5.00 this evening just as the train was leaving the Dehiwala Railway Station. Police say the bomb was in the hood rack of the 5th compartment of the train. Many of the victims were office workers headed home at the end of the workday and the victims who suffered injuries were rushed to the Kalubowila teaching hospital and National hospital Colombo. Meanwhile the Government Railway said that Train services along the coastal line resumed a few minutes ago but will be limited to two way traffic on a single line resulting in delays. Emergency aid from the People of Sri Lanka to People of Myanmar has been air dashed to Myanmar. Ministry of Health helped for the transportation of the consignment up to Katunayake and Mountain Hawk Express Ltd, Licensees for FedEx international Courier Service helped with the logistic service for the Myanmar relief. Earlier all three chapters of Maha Sangha have appealed for urgent assistance from the public to help people of Myanmar affected by the recent cyclone and community and Business sector given good respond on the Maha Sangha's request. Subsequently, Minister Milinda Moragoda, Minister Laksman Yapa Abeywardana and Chief justice Mr. Sarath N Silva called a meeting and established a special committee including Aggamahapanditha Kotugoda Dammawasa anunayaka, Ittapana Dammalankara, Brahmanawatte Sivalee, Prof. Bellanwila Wimalarathana, Maduluwawe Sobitha, Muruttetuwe Anannda, Daranagama Kusaladamma and Thiniyawala Palitha theros to coordinate with relevant authorities on this event. Sri Lanka Tea board, Maliban Company, Joint apparel Exporters forum and John keels joined with the Minister of Tourism took action to organize a relief consignment to Myanmar cyclone affected countrymen as a gesture of goodwill. In fact the Cultural and Buddhist Religious Relations between Sri Lanka and Myanmar date back to several centuries in the history. The relief project initiated by the Ministry of Tourism was actively supported by the High Buddhist Priests, Catholic Church and several statutory bodies and several business establishments. Minister of Tourism requested the Government of Norway through Ambassador in Colombo Tore Hattrem for financial support for the air lifting of the consignment to Myanmar. The request made was swiftly acknowledged by the Government of Norway and it was announced that would the cover the cost of carriage up to U. S. $ 90,000/-. Further in response to a special request, the Norwegian Government consented additionally to meet the cost of air passage to the 10 member delegation headed by Bandula Gunawardena, Minister of Trade, Marketing Development, Co-operatives & Consumer Services, accompanying the relief consignment to Myanmar. Installation ofo surveillance cameras in private buses to detect un-disciplinary activities and financial frauds has commenced. Two such cameras were installed in two private buses plying between Colombo and Badulla. The cameras record all visual and audio information from the start to the end of the journey. President of the Inter-provincial Bus Owners’ Association and Basnayake Nilame of the Sri Saman Devalaya in Mahiyanganaya, Ranjith Amarasinghe in whose buses the cameras were installed said the cameras also records the persons who place parcels in the buses and the exact time of such placements. He adds that it would be possible to find out that bus crew who treat the passengers in a harmful manner and buses which are overcrowded. Mr. Amarasinghe said all buses belonging to the Sri Lanka Inter-provincial Private Bus Owners’ Association will be provided such cameras in future. Eastern Provincial Council Chief Ministership is to be rotated amongst the three community leaders elected recently at the provincial council election. Just after the elections to the Provincial Council, United Peoples Freedom Alliance which emerged victorious with 18+ 2 bonus = 20 seats out of the total of 37, appointed Chanthirakanthan Sivanesathurai, the Tamil candidate from the Tamil Makkal Viduthalai Pulikal as Chief Minister of the East. After a period of two years, he is to be succeeded by Minister M.L.A.M Hisbullah, a Muslim community candidate for the next two years. After Hisbullah, a Sinhalese elected from the Sri Lanka Freedom Party within the UPFA is to be given the Chief Ministership for the balance period of one year. The issue of Chief Ministership was considererd in the midst of the UPFA as a contentious issue and earlier, Hisbullah demanded that he should be made the Chief Minister as Muslims have won 8 out of the 18 UPFA elected seats. Liberation Tigers of Tamil Eelam a separatist outfit alleged that 16 civilians were killed in a roadside claymore attack by the Deep Penetration Unit of the Sri Lanka military at 2.00 pm yesterday, at Akkarayan – Murukandy Road in Kilinochchi, an area coming under their control within the Vanni region, located in the Northern province of Sri Lanka. Ms. Barks-Ruggles emphasized the importance of continuing the dialogue between the U.S. and Sri Lanka, which have enjoyed 60 years of unbroken friendship. She commended recent efforts to address some concerns of the U.S. and others on human rights. In particular, Ms. Barks-Ruggles welcomed recent releases of former child soldiers by the TMVP. She urged the government and others working on this problem to maintain this momentum and ensure that all remaining child soldiers are released in the shortest possible time. Colombo, 22 May, (Asiantribune.com): M.L.A.M. Hisbullah took oaths this morning at the Temple Trees as the Eastern Provincial Council Minister of Health, Youth and Women's Affairs before President Mahinda Rajapakse. However, Mr.Hisbullah said yesterday he agreed to abandon their protest if the government adds education to the ministerial portfolio offered to Hisbulla in addition to Health and Muslim Affairs. The majority of the people in the Eastern Province, he said, were Tamil speaking and the subject of education should be assigned to a minister who was conversant with their problems and needs. 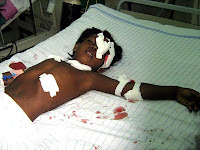 LTTE terrorist yesterday (May 18) made an abortive attempt to halt the army advance on the Mannar front by attacking the Nadunkandal army deployments. According to military spokesperson Brigadier Udaya Nanayakkara the terrorist launched heavy mortar fire around 1.40 pm. One soldier was killed in this incident. Later, the terrorists attacked the army defence around 3 pm. Troops gave an effective retaliation killing 11 terrorists and forcing the others to withdraw, he said. 4 soldiers suffered injuries in this incident, he added. Troops forced into terrorist defences in the Vavuniya front yesterday (May 18) as sporadic clashes were reported between troops and LTTE in Periyamadu, Palampiddi, Palamoddai and Mundimurippu general areas , security sources said. Eight LTTE terrorists were killed in addition to 5 soldiers who have laid their lives during the confrontations, on Sunday. Four soldiers were also reported wounded including two due to an AP mine explosion in general area Palampiddi. Senator Barrack Obama is only 23 short of the required 2,025 pledged delegate votes as Oregon and Kentucky go to polls today. He is also ahead in super delegates by 15. He would be heading to Iowa where he took his first "Primary baby steps" months ago prior to triggering a stampede winning 14 states in a row, and then to a much needed rest in Florida. Senator Hillary Clinton is expected to win Kentucky handily even though the result would be immaterial at this stage, she cannot overtake Obama. George Bush’s “appeasing the enemy” speech before Israel Knesset received a thumping reprisal immediately from Democratic presidential front-runner Barrack Obama last week. Republican presumptive nominee John McCain joined in the fray and traded furious barbs. The President of Sri Lanka issuing a Vesak Day message said his government’s hope is to bequeath a prosperous country by ridding the country, torn by terrorism, of robbers and turn it into a land of tranquility. “Our resolve on this Vesak Day is to work with a correct vision in keeping with the Dhamma. This will see the fruition of our actions to build a new Sri Lanka,” he said in the message issued to commemorate the birth, attaining Buddha hood and passing away of Siddhartha Gauthama, more than 2550 years ago. “The Buddha showed us that advancement in this world and the next could be achieved by appreciating what is good. The policy of the government is to steer the country to the correct path by adhering to the Dharma. In doing so our responsibility is to tolerate other opinions and act with loving kindness. “As the Buddha has taught: “Be alert; do not idle. Follow the law of virtue. He who is virtuous lives happily both in this world and the next” – Dhammapada. Ch.13 v 168. “Let us stop being indifferent and speaking ill of the past. We should brook no delay in working to build a virtuous land. “Our hope is to bequeath a prosperous country that is without armaments and fear of enemies and robbers, a country in which all could live in tranquillity. Our resolve on this Vesak Day is to work with a correct vision in keeping with the Dharma. This will see the fruition of our actions to build a new Sri Lanka. “Let us resolve make this Vesak Festival meaningful by seeking refuge in the serene path of Buddha. Chief Minister of Eastern Province Sivanesathurai Chandrakanthan says that he is committed to work for the betterment of all ethnic groups in the province. At a special interview with the SLBC today, he said that the first task of his agenda is to develop the province. The people of the area have been suffering for over 20 years due to lack of proper administration.However the avenues are now open to focus lights of development towards the gloomy areas in the province. The areas which the priority should be given have already been identified. Accordingly the fields of health, education and self employment will be developed soon. The new Chief Minister added that it was blessing for him to worship the temple of the tooth in Kandy and to get the blessings of Mahanayaka Theras. The Chief Minister also met the Maha Nayake Theras of Malwatte and Asgiriya Chapters. The theras invoked blessings to him for his future career. He visited the Museum of the Temple and focused special attention to the photographs which show the damages inflicted to the temple by the LTTE attack in the past. The Chief Minister also visited Ganga Rama temple in Hunupitiya, Colombo and took part in religious activities. Meanwhile Minister Dr. Rajitha Senarathne says President Mahinda Rajapakse is the 1st leader in the country who bravely stood against racism in order to consolidate peace and harmony in the country. The president’s genuineness is apparent by the appointment of Mr.Sivanesathurei Chandrakanthan as the 1st chief minister of the Eastern Provincial Council. The president has corrected the ills committed by the former leaders through this act. It has been proven that the president is a leader who is dedicated to establish peace in the country. Mr Sivanesathurei Chandrakanthan gained the maximum preferential votes of 41,936 out of all candidates. Minister Senarathne therefore points out, appointing him as the chief minister is implementing public mandate, but not on communal basis. Rumours are spreading on JVP’s behavior on inaugural Eastern Provincial Council meeting .At present both the UPFA and the UNP are waiting the JVP’s act on this issue. The JVP said it could now play a crucial role because the UPFA and other opposition parties were tied at 17-seats each. Leading JVP front-liner said the party believed the newly-elected council was in crisis even before it started functioning but he did not indicate the JVP would respond. The JVP has one seat at the EPC and M.L.A.M.Hisbullah and his two followers who got seats of the EPC decided to act as independently at the EPC.On Sunday Mr. Hisbullah said another member of the UPFA agreed to support Hisbullah faction. However JVP says it would not assist the political parties which help for separatism. Issuing a press statement the JVP Politburo told they have experience on major parties move during the EPC campaign. However during the polls Janatha Vimukthi Peramuna (JVP) recorded a dismal performance in terms of the percentage of votes the party polled. Political analysts say ex- rebel leader Mr.Pillayan has wide experience to administer the EPC and assists public to develop the region. However they said the JVP and Tamil Democratic National Alliance which have two seats at the EPC would be the key deciding factor to protect the present EPC administration. A Spokesman of the Tamil Democratic National Alliance said they would help UPFA in the eastern Provincial Council. According to the reliable sources some leading UNPers plans to defeat UPFA administration using Hisbullah faction at the first council meeting. The UNP, SLMC and the three member group led by Hizbullah charged that Friday’s appointment of Sivanesathurai Chandrakanthan, alias Pillayan as chief minister for the Eastern Province was unconstitutional since he did not command a majority in the council and that the possibility of defeating the UPFA at the first council meeting was under active consideration. However UNP Secretary General Tissa Attanayake said the UNP has so far not decided to obtain Hizbullah’s support to defeat the present administration of the EPC. An LTTE terrorist was reported killed by SL Army snipers deployed ahead of enemy defences in general area Alanakulama, Mannar yesterday(May 16), security sources said. 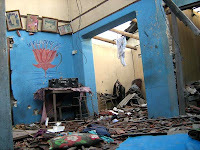 Eight LTTE terrorists were reported killed during intermittent clashes erupted between troops and LTTE ahead of the Wanni and Northern battle fronts on Thursday (May 15), security sources report. On the Jaffna theater of battle, a terrorist was reported killed sniped in general area Muhamalai. A soldier was also injured due to an AP mine explosion in the same area, in addition to another who sustained injuries in a similar explosion at Kilaly. The Sri Lankan Air Force fighter craft made precision air sorties at the Iranamadu runway yesterday evening in Mullaittiuvu, Air Force sources said. “All necessary measures will be taken to bring about peace and harmony in the East. I will take all required steps to embrace Muslims and Sinhalese living in the East and ensure their security. As a first step, I will be making arrangements to meet the Muslim leaders of the East to dispel if and any doubts that loom in their hearts and minds about my genuine love and brotherly affection towards them, especially of those in the East, said Sivanesathurai Chandrakanthan alias Pillayan, the just sworn-in Chief Minister for the Eastern Province. The child soldier turned provincial Chief Minister was speaking to News-Lanka just after he was sworn in as the Chief Minister of the Eastern Provincial Council. Sivanesathurai Chandrakanthan, 33 years old youngest Chief Minister, was earlier a child soldier, abducted at his tender age of 14 years and given arms training by Liberation Tigers of Tamil Eelam and trained as another killing machine. In 2004 March, he along with V. Muralitharan, also known as Col. Karuna left the LTTE and was one of the founder members of TamilEela Makkal Viduthalai Pulikal. Later the outfit got rid of the word ‘Eelam’ and renamed it as Tamil Makkal Viduthalai Pulikal. Chanthirakanthan led many successful battles against the LTTE in the Eastern Province and fought standing shoulder to shoulder with the Sri Lankan security forces to liberate the East. He took over the leadership of the TMVP after Muralitharan left the country. As a first step he registered TMVP as a political party and successfully contested in the Local Government elections held in the Batticaloa district. Subsequently under Chanthirakanthan’s leadership, TMVP entered as one of the coalition partners with the ruling United Peoples Freedom Alliance and contested East Provincial Council election. After swearing in as the Chief Minister of the Eastern Provincial Council, he spoke with News-Lanka. He said, I want to bring about a good and sustainable relationship between the Tamils and the Muslims. To do that, he added, I have decided to meet the Muslim leaders and dispel their suspicion about the East Tamils and build cordial and brotherly relationship with them. Therefore as a first step, I wish to meet these Muslim leaders. Almost all Muslim leaders are Ministers and if one of the leaders arranges a meeting in their Ministry office, inviting other Muslim leaders also for a discussion, I am prepared to participate and listen to them and to assure that I care to work with them. Chanthirakanthan said as far as TMVP is concerned, we have already handed over all the underage children who were with us. As far as I am aware, there are no more underage children with us. If anyone points out as we have still underage children with us, then I am prepared to investigate and do the needful. I want to provide opportunities for unemployed youths of the province to find for themselves suitable livelihood arrangements, Chanthirakanthan said. Also he said that still there are thousands of Internally Displaced Persons in our midst. We will try our best to see that they are resettled in their respective villages and they have roof over their heads. Chanthirakanthan said that he is thankful to President Mahinda Rajapakse and other Government leaders for the confidence they had on him by making him the Chief Minister of the East. He assured, I will try my best to live up to their expectations by dedicating fully and working for the well-being of the people of the East. He said, my appointment as the Chief Minister is an eye opener for our Tamils brothers in the North. I think by now it will dawn on them that to undertake their day today business with the Government they have an option available for them. They have to come up to openly resist the Vanni Tigers and live peacefully. Eastern brothers are always there to assist them in their battle for freedom against the ruthless Prabakaran and his killing machinery. He thanked the Buddhist clergies and the leaders of the Jathika Heela Urumiya for the support and the trust they had on him and for openly supporting him in his bid for the Chief Ministership. Chanthirakanthan said that he was very sad to hear of the Colombo bomb blast and the death and injury of Police personnel and civilians. He said that he wishes to convey his condolence to the bereaved families and assured he will work with the Sri Lankan security forces and ensure the security of the Easterners. The newly sworn in Chief Minister reiterated that with the help of the people of the East, he was able to defeat the Vanni Tigers democratically. He further said that he along with TMVP has entered the mainstream of politics and there is no turning back from the democratic mainstream. When asked about MLAM Hisbullah’s statements before and after his swearing in as Chief Minister, Chanthirakanthan said he is not prepared to response to the accusations made by Hisbullah. He said Hisbullah is a person and not an organization and he is not the voice of the Muslims of the East. He said, there are many respected and well trusted Muslim leaders in the East. He also said I wanted to live peacefully and harmoniously with my Muslim brothers of the East and by responding to the unsubstantiated allegations, it would definitely create a provocative situation in the east. This is what Rauff Hakeem and UNP wanted and longing for. I can only appeal to Hisbullah not to fall into the trap of Rauff Hakeem and UNP and not to be provocative with communal speeches.